Thank you all for the love on my post about the Cotton Contest! Your support means the world to me! PLEASE keep voting HERE every day. The voting process is long and intense. This first round up ends the 22nd! I swear I haven’t slept in 2 days because I am that nervous and anxious lol I want this so bad. Pairing maxi skirts with leather jackets has been a trend for awhile now and one that I have been wanting to try. So this is my little spin on it. I love being inspired by street style and current trends and then making it my own. This is my first time wearing a maxi during the winter months. The best way to make it winter appropriate is by layering and wearing boots/booties. I probably should have worn a scarf but I didn’t have any that looked good 🙁 I’ve mentioned so many times that I love feminine outfits with an edgy twist so this was right up my alley. It has a little boho vibe too which I love. I’m leaving for LA next week and I am so excited. I feel like this new year has started off great for me and I really hope that it continues down this path. VOTE HERE! And remember you can vote every day! Naty, you have nothing to worry about! You got this! I'm excited for you on your trip to LA, my home! Ask her to take you to Runyon Canyon. The views are amazing! You can see the Hollywood sign, Hollywood, Downtown LA and, with good weather, the pacific ocean, all from this one spot. The Venice Boardwalk is also a must see. I know you are gonna love it! Loving this outfit, especially the maxi. I am definitely inspired and I will try this trend! Love the juxtaposition of feminine and edgy! BTW I have been voting for you in the contest…:) Good Luck! Voted again! You've got this! Loving your outfit too! You look great in maxis! I loooove this flowing skirt…amazing outfit! Just found your blog and I am loving it! Love your outfits girl. Please check mine and maybe we can follow each other? Please let me know. My fav look! Maxi's are the best! Love you! Love this look! I love how feminine your maxi skirt it too! Lovely outfit.leather jacket is awesome. I'm in love this is so cute! Great work , u look amazingly great! LOVE, LOVE this look! That skirt is soooooo pretty! I can already picture you wearing it in the summer in a totally different way. Love the maxi paired with the leather jacket! Must try this soon! Thanks for the inspiration babe! Love this look and how you styled this maxi skirt, really chic! Very cool skirt. I saw a similar maxi skirt in stores the other day and I was tempted to buy it! 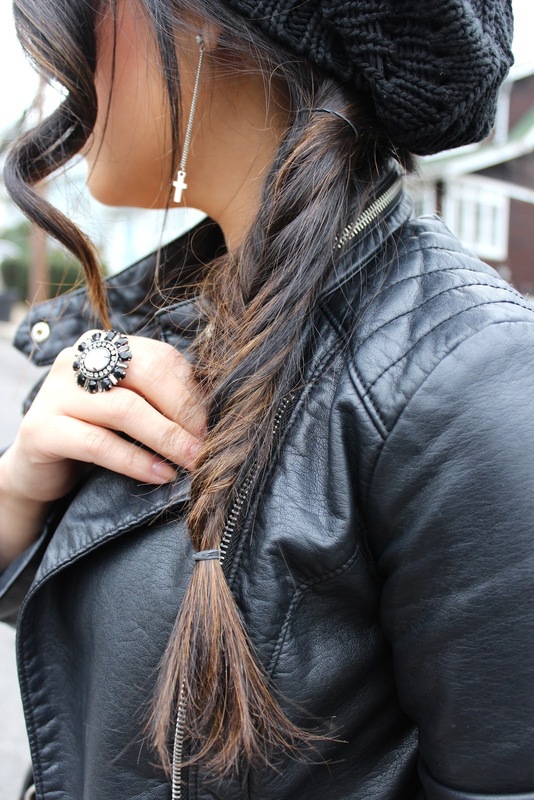 Love it paired with the leather jacket. Have fun in LA! stunning! I did a similar look on my blog in october with a purple maxi i picked up at forever21. it's super on trend look. great great great! !